Does anyone else find this troubling? 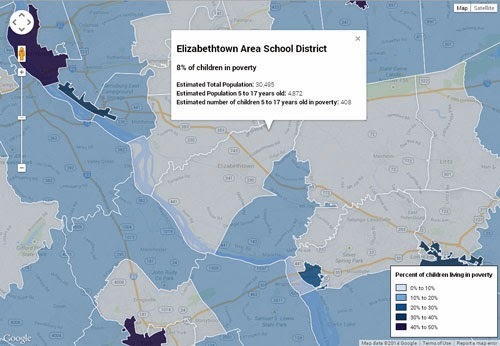 The U.S. Census, as reported by LancasterOnline, shows that 408 children ages 5 to 17 live in poverty in the Elizabethtown Area School District. That's 8 percent of the students in the school district (not just those attending public schools). According to the newspaper website, the numbers are "noticably higher than they were in 2009." And the numbers are likely even higher when you consider they don't include younger children who aren't in school yet. You also have to consider a family of four that brings in $27,000 a year. They aren't in poverty, according to the federal rules, but they certainly aren't making ends meet easily. Through my church, Christ Church United Church of Christ, I learned that many families with students in the schools can't afford meals during the weekends. Members of Christ Church are helping the school district to distribute backpacks full of food to help those families through the weekend. It's easy to overlook the issue of poverty in a community like Elizabethtown because the concentration isn't as great and noticeable as it is in an urban environment. LancasterOnline reported that nearly one-third of children in the Lancaster City School District are in poverty. But the issues are real here in rural parts of the county, and we all as a community need to be aware and step up to help when we can.